Ed. Note: This blog was originally posted on the Let's Move! blog. To view the original post click here. In celebration of Farm to School Month, the First Lady invited students from the STAR School in Flagstaff, Arizona; Willow Cove Elementary School in Pittsburg, California; and Greenview Upper Elementary School in Lyndhurst, Ohio to participate in the fall harvest of the White House Kitchen Garden this year. These schools all participate in farm to school programs that incorporate fresh, local food into their school meals and teach students about healthy eating through hands-on experience in their own school gardens as well as nutrition education in the classroom. Each school received support from USDA’s Farm to School Program, created as part of the Healthy Hunger-Free Kids Act, to execute their efforts. Students from Harriet Tubman Elementary and Bancroft Elementary in Washington, DC, who regularly help in the Kitchen Garden, also joined the First Lady at the harvest today. In addition, three chefs paired with three of this year’s Kids’ State Dinner winners also joined the fall harvest. Earlier this year during the 3rd Annual Kids’ State Dinner, the First Lady announced the Kids and Chefs Cook for Success collaboration. All 54 winners of this year’s Kids’ State Dinner have been paired up with chefs in their communities to host free and healthy cooking demonstrations this fall. These cooking demos help support efforts to build and teach basic cooking skills to kids and families in communities across the country. 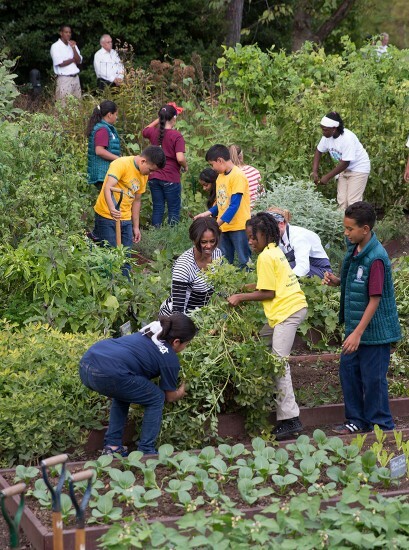 The Kids’ State Dinner winners, chefs, and students from across the country joined the First Lady in harvesting everything from sweet potatoes, pumpkin, and peppers, to kale, eggplant and even peanuts from the White House Kitchen Garden. Following their time in the garden, each chef worked with a Kids’ State Dinner winner and a team of students to prepare a delicious and nutritious fall-inspired meal with the produce harvested. For more tasty, kid-friendly recipes, check out the winning recipes from this year’s Kids’ State Dinner. Interested in planting your own kitchen garden? Our Gardening Guide can help you get started planning for next year!